I’m not much of a sports fan, but why do I like Game Day? THE FOOD! Finger foods, dips, fried everything…sounds great now, but a future food hangover in the making. 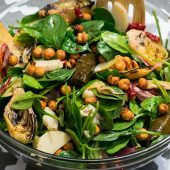 This dish includes all the wonderful flavors of your Game Day favorites like buffalo sauce, ranch, and fries, and eliminates that next day bloat with plant-based ingredients. 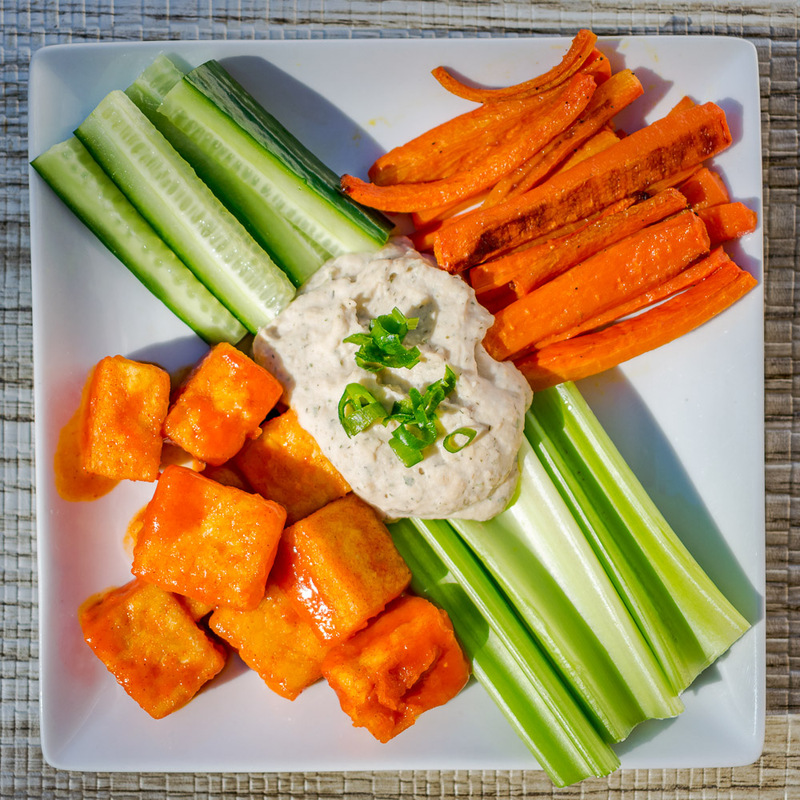 This recipe serves about 4 people, less if you are like my husband and I (“Hmm, let me make sure these carrot fries are done by dipping them in hummus. Now in the buffalo sauce…”). You may halve the hummus recipe if you like, but I don’t recommend it. You’ll want to cover your plate with it. 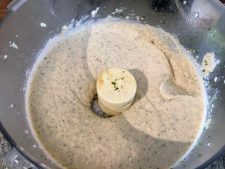 For the hummus, throw all the ingredients in a food processor and blend on high until creamy. I always find that a pinch of salt is not enough. Taste, then add more salt if necessary. Put aside and store in an air-tight container in the refrigerator. 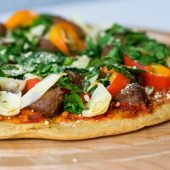 This can be made the night before or while your carrots are baking. Preheat the oven to 400 degrees. 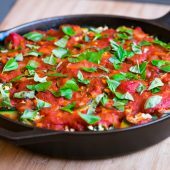 Line a sheet pan with a greased foil. 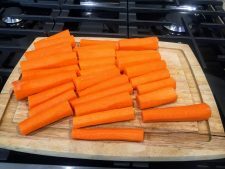 Peel and slice your carrots, trying to keep them as close in shape/size as possible. I cut mine close to 3 inches in length then 1/4 them into spears. 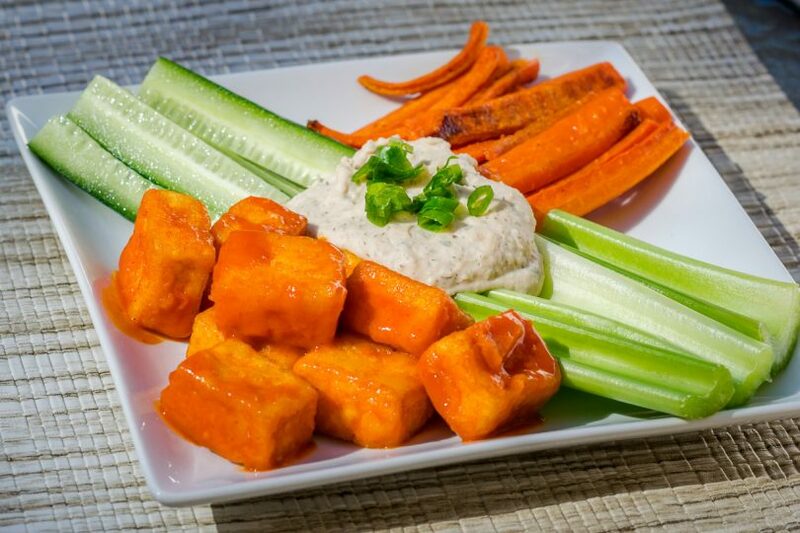 Toss the carrots in olive oil and spread evenly on the pan. 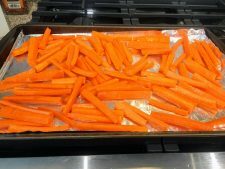 Sprinkle the carrots with salt and pepper and place in the oven. Bake for about 45-50 minutes, shaking about half way through. Carrots will start to brown and resemble the texture of a baked sweet potato fry. Next time I’ll try these in the air fryer. While the carrots are baking, add the cornstarch and salt into a medium-sized bowl. 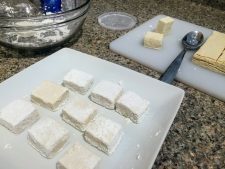 In batches (I split into 3 batches), add your pressed, cubed tofu and toss gently. You want the cornstarch cover the tofu, but not clump. In a skillet, heat oil on high heat and gently place the tofu into the oil. 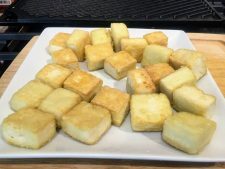 Allow the tofu to fry on one side until it is a golden color. This will take about 4 minutes. Then carefully flip the tofu to the other side until golden. I use a fork to gently press on one side of each tofu piece to flip it. The second side will take less time. Remove from pan and set aside in medium bowl. In a small sauce pan, heat the buffalo sauce and Earth Butter until the butter is melted. 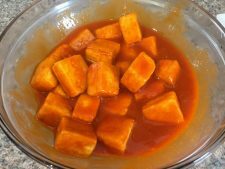 Pour the buffalo sauce over the tofu and gently toss. 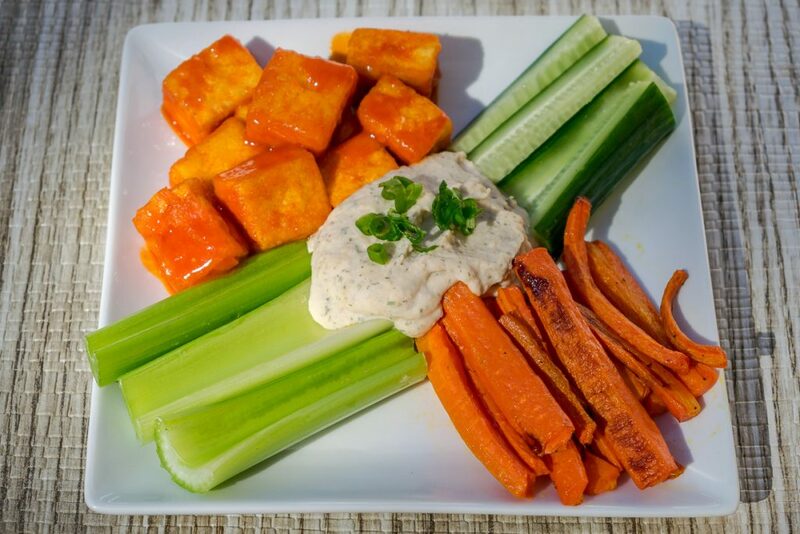 Arrange your tofu, carrot fries, and sides of dipping veggies on a plate topped with the ranch hummus and green onion. 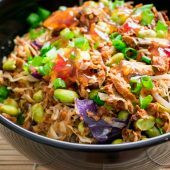 Serve immediately and enjoy a game day favorite, now without the guilt!